Lt. Gov. 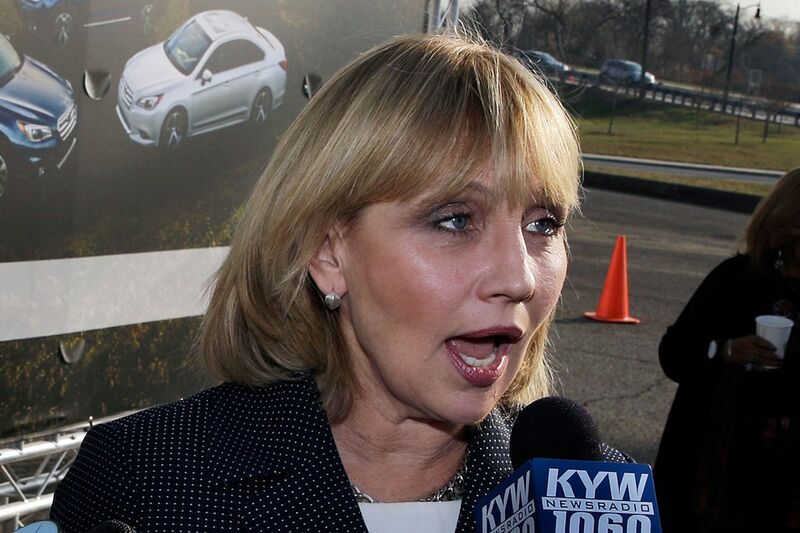 Kim Guadagno has said she is considering a run for governor. New Jersey Lt. Gov. Kim Guadagno took her clearest step yet Wednesday toward a gubernatorial run in 2017, announcing an organization led by the campaign manager whom Gov. Christie banished after the George Washington Bridge lane closure scandal. A website for the privately funded 501(c)4 organization, Building a Better New Jersey Together, went live Wednesday. In a conference call, Guadagno described the announcement of the organization - which she said is intended to find solutions to New Jersey's problems - as "step one of a long process," and said the call was "the first of what I am sure will be many calls to you and others." "Solutions will not come from Trenton, but from us New Jerseyans who live in the real world," said Guadagno, who has served as lieutenant governor since 2010. She touted private-sector job gains and declining unemployment during that time. Christie's term ends in January 2018. Guadagno has said she is weighing a run for governor, though she didn't broach the topic Wednesday. The new organization is a "think tank," she said, focused "not on politics, not on campaigns, and certainly not on elections." The organization's executive director is Bill Stepien, who ran Christie's two gubernatorial campaigns but was dropped by the governor after his name appeared in emails connected to the lane closure scandal that became public in January 2014. Christie ordered Stepien to withdraw his name from consideration as New Jersey's GOP chairman and to withdraw as a consultant to the Republican Governors Association, which Christie chaired at the time. Stepien resurfaced in New Jersey politics last year, advising Assembly Republicans in their election efforts. Other Republicans considered possible contenders for governor include Assembly Minority Leader Jon Bramnick (R., Union). Jerry Langer, a Morris County trucking magnate who was a member of the leadership team backing the governor's presidential campaign, is the organization's president. He began Wednesday's call by saying the organization had needed a partner: "someone who has gotten things done in New Jersey, someone who doesn't play the insiders game." He then introduced Guadagno as the organization's honorary chair. It wasn't clear who was on the conference call Wednesday, but powerful Ocean County GOP Chairman George Gilmore spoke at one point, congratulating Guadagno for the initiative. Registered under Section 501(c)4 of the tax code, the group "may engage in some political activities, so long as that is not its primary activity," according to the IRS. Such groups do not have to disclose their donors. Guadagno's move follows Democrats who have set up similar or more overtly political organizations as they contemplate running for governor in 2017. Allies of both Senate President Stephen Sweeney (D., Gloucester) and Jersey City Mayor Steve Fulop have established super PACs that can raise unlimited sums of money from corporations, unions, and individuals. The group backing Sweeney, New Jerseyans for a Better Tomorrow, raised nearly $1.2 million between June and January, according to its most recent filing with the state. The political action committee supporting Fulop, the Coalition for Progress, raised $3.1 million between July and the end of 2015, according to Federal Election Commission data. Phil Murphy, a former Goldman Sachs executive and U.S. ambassador to Germany, established a nonprofit advocacy group in 2014 called New Start New Jersey. Then in September 2015, he launched a multimillion-dollar advertising campaign through a political organization registered with the IRS under Section 527. It can raise an unlimited amount of money. Murphy has described the group as an "issues organization" aimed at promoting a middle-class agenda and said it wouldn't fund campaigns. The group, New Way for New Jersey, has raised about $1.9 million, according to IRS filings. It had spent almost all of that as of its year-end report. Murphy and his wife, Tammy, accounted for the vast majority of that haul. The Democrats' groups have disclosed their donors, though not all are required to do so.